I was recently introduced to an Australian podcast called, The Art of Decluttering. Hosted by two moms/entrepreneurs/professional organizers, Kirsty and Amy, The Art of Decluttering is unlike any other podcast I’ve ever laid…ears on. Who knew that you could learn so much about cleaning up, just by tuning in once a week. Time to kick things off! The first thing you’ll want to do (and this applies to every category of clothing) is lay your items out in front of you. Then, to simplify, group them – sandals in one pile, formal in another, boots, sneakers, and so on. From there, start trashing anything that is ripped, has holes, lost elasticity, or needs to be thrown out. Now that we’ve weeded out the old and dirty, it’s time to take on what’s left. Do they fit? Do you wear them? Are they in good condition? If you’ve found yourself with six pairs of shoes that no longer fit, but are in great shape, donate them. If you’ve got yourself three pairs of sandals that still have their tags after a year, donate them. Here’s a good rule of thumb – clear out at least one pair of shoes from each category. One less pair of boots never hurt anybody! Similarly, to how we tackled our shoes, we declutter our underwear in the same fashion, one category at a time. For instance, begin with socks... declutter any odd socks or socks with holes and pair up random socks that you can find the buddy of. Once you've curated your socks down to pairs that are in good condition and that you enjoy wearing, you can move onto the next category which may be stockings. Then bras, undies, lingerie, etc. Today you may not end up with much for donating, but before you throw anything out, consider recycling them! Old undies make for great rags, pet toys, and believe it or not, 100% cotton underwear can become one with your garden via compost. There are also several local and national organizations that will take your used bras and socks. The same rules apply – lay it all out in front of you and group by category. This one was the easiest for me as I don’t own much of either. Now, we’ve put these two together because the decluttering doubts that might pop up for these items are often the same... Don’t be surprised if you find yourself saying as you look through dresses and jackets, "But I paid a lot of money for that dress/ jacket". This is a really common thought! Instead of feeling bad and keeping the item purely because it was expensive, take a deep breath, acknowledge that the money is spent and then decide if you love the dress/jacket enough to keep it and commit to wearing it. If the item is in great condition you may also be able to recoup some of the cost by selling it second hand! Importantly, let this experience encourage you to be a more mindful shopper in the future. That way, the next time you buy a new dress, you’ll consider whether it’s a good investment or not, given the fact you might only wear it three times. Bridesmaid dresses anyone? Day 4: Pants, Skirts, & Jeans, Oh My! Today is all about your bottom half. The first tip – create some clear space on your bed so you can bring all your bottoms out into one space to go through. Create piles of like with like, meaning all jeans together, all work pants together, all shorts together etc. Begin with any pile you like and keep only pairs of shorts, pants or skirts that fit you, you enjoy wearing, AND you see yourself wearing in the future. What do you do if you end up with 15 pairs of jeans that you really love? Can you keep them all? The short answer is you can do whatever you like... just ask yourself if you have the space to keep 15 pairs of jeans? Will you really wear them all on a regular basis? Does it add value to your wardrobe to have 15 pairs of jeans or would you find it easier to get ready if you only had to choose between 6 pairs? When putting away your clothes, regardless of whether you hang or fold, be sure to keep 'like with like' in your wardrobe – pants with pants, skirts with skirts, etc. This will make finding a particular item easier and also make putting the clean washing away much quicker too. This is the final countdown, and it might also be the biggest day of them all (it was for me). As with bottoms, use your bed to create piles of 'like with like' so you can see what you have and then declutter category by category. T-shirts, gym tops, formal tops, casual tops, sweaters, etc. As you sort and declutter one pile at a time, consider the space you have in your wardrobe and drawers as natural limits for how many tops you can practically keep. 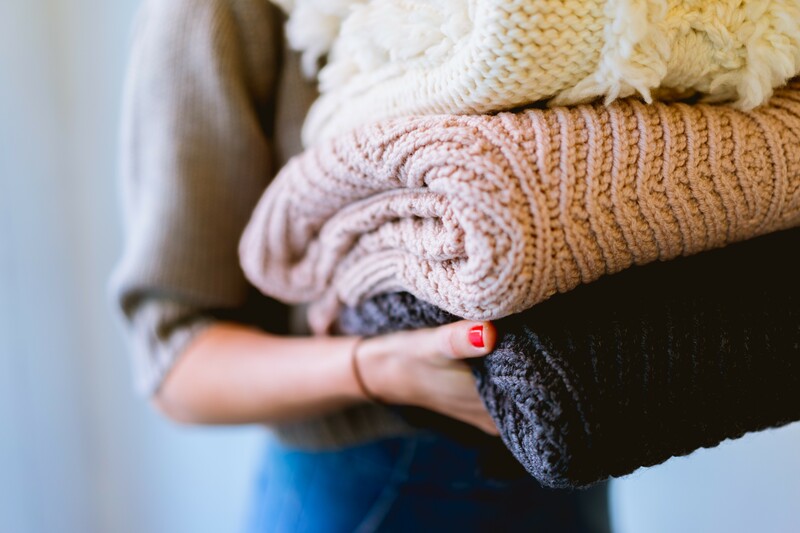 Also, here’s a great tip I learned from the Decluttering gals – We wear 20% of our clothes 80% of the time, so if you're not sure if you should declutter a top or not, ask yourself if it lies in the 20% you regularly wear or the 80% you're not that fond of. Who knew cleaning was so mathematical? That’s it! You’ve done it, and I don’t know about you, but I’m feeling twenty pounds lighter…and desperately in need of a shopping trip!